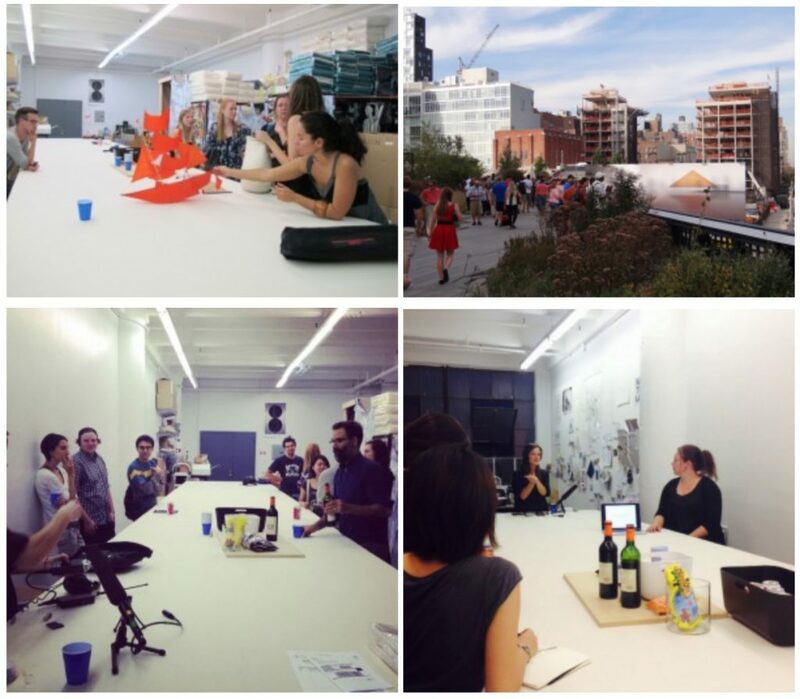 This October ’14 Judith was invited by slowLab at the Pratt Institute in New York for a lecture and participation in slow dialogue for the series Mapping Slow Design (Topics, Tools and Traces). slowLab hosts a knowledge residency at the Pratt Institute this fall/winter 2014-15. 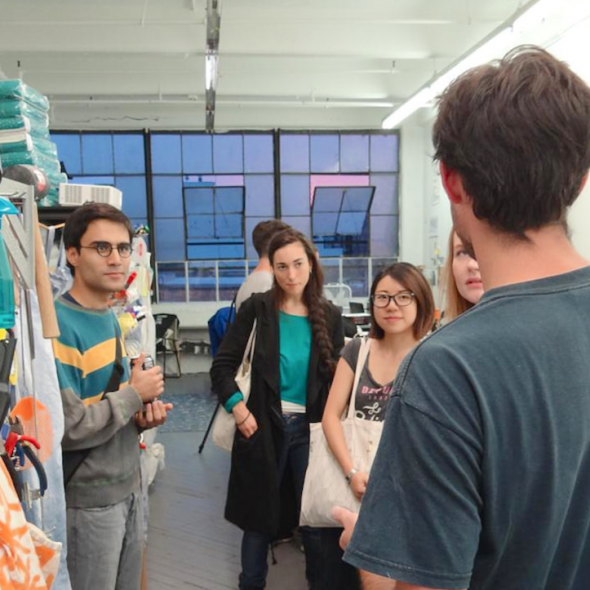 The lecture was held at the great studio of Emily Fischer’s Haptic Lab in Brooklyn. slowLab is a nonprofit research platform for Slow design thinking, learning and practice. Founded in New York and based in the Netherlands, slowLab supports an international network of Slow thinkers and creative actors (designers, artists, architects, technologists, environmentalists, social theorists, economists, educators, and activists) who participate in its research, public presentations, publications, academic projects, and evolving dialogues. In Fall/Winter 2014-15, slowLab brings its resources and network to Pratt Institute for two related programs: a Slow knowledge residency with students and faculty and an exhibition at the Pratt Manhattan Gallery. Both exhibition and residency offer opportunities for research and development, enhanced by the live presence of Slow actors from slowLab’s international network. Those individuals and groups are invited to share their polydisciplinary perspectives and methodologies with the Pratt learning community, stimulating new spaces of dialogue and experience, while modelling unexpected ways of engaging local issues and contexts. slowLab’s programming at Pratt is organized within a framework of six core research topics: SLOW IDENTITY : SLOW AGENCY : SLOW GOVERNANCE : SLOW ECONOMY : SLOW ECOLOGY : SLOW PEDAGOGY. For each of the topics, there is a proposed set of tools: simple strategies and attitudes that creative practitioners adopt to deepen into Slow modes of thinking and doing. The result of applying the tools of Slow knowledge are traces: projects and resources that should be understood not as ends in and of themselves, but rather as artifacts of always-evolving creative processes. Students and faculty who choose to participate in the Slow knowledge residency are encouraged to read, discuss and further explore the topics, tools and traces on the following pages. These provide an introduction to slowLab’s exhibition at the Pratt Manhattan Gallery, the contents of which are a central driver of the Slow knowledge residency. The sections titled ‘Defining Topics’ provide the parameters of each Slow topic. The sections titled ‘Exploring Tools’ introduce a collection of Slow actors who slowLab has invited to focus on the Slow knowledge tools that make their professional practices relevant within a given topic.The pages titled ‘Discovering Traces’ describe the physical exhibits that will be included in the exhibition, with short texts about the contributions they make to Slow knowledge. Facilitation talks this october are by Judith Wehmeyer, Alessandra Pomarico, Henriette Waal, Amy Franceschini, Julia Mandle. Judith Wehmeyer van den Boom presents methods from the ArtEZ Academy of Art and Design in exploration of the topic Slow Identity. In a forthcoming project, ‘Uncertainty Studios,’ product and interaction designers use the unknown as a tool for the emergence of new forms and perspectives. The slowLab exhibition at Pratt includes a video interview about the tools of Slow Identity that are applied in the professional practice of JUDITH WEHMEYER VAN DEN BOOM (NL). Judith Wehmeyer van den Boom’s work explores the expanding consciousness and roles of designers in today’s rapidly transforming environmental, technological, social, and cultural landscape. She regards design as a communicative, collaborative process that gathers diverse minds, materials, and contexts to enable new forms of dialogue and relationship. She is Head of Product Design at ArtEZ Academy of Art and Design and co-founder of Studio BoomWehmeyer, a multidisciplinary studio that explores ‘craft’ as a tool for people to achieve an authentic sense of self and renewed connectedness with others. PARTICIPATING SLOW ACTORS A collection of Slow thinkers and creative actors take part in the exhibition and residency. They are: Maria Blaisse (NL), Monika Hoinkis (DE), Julia Mandle (US/NL), Alessandra Pomarico (IT), Amy Franceschini (US), Caroline Nevejan (NL), Fallen Fruit (US), Henriette Waal (US), Interboro Partners (US), Jeanne van Heeswijk (NL), Jorge Otero-Pailos (ES), Judith Wehmeyer van den Boom (NL), Lanka Horstink (NL/PT), Ljiljana Rodic-Wiersma (BA/NL), Nika Jazaei (IR), Peter Wouda (NL) and 16 Beaver Group (US). slowLab programming at Pratt is supported by the Pratt Manhatttan Gallery, the Pratt Institute Office of the Provost, the Pratt department of Graduate Communication Design, and the Creative Industries Fund NL (Stimuleringsfonds Creatieve Industrie). Additional support provided by the Noguchi Musuem.